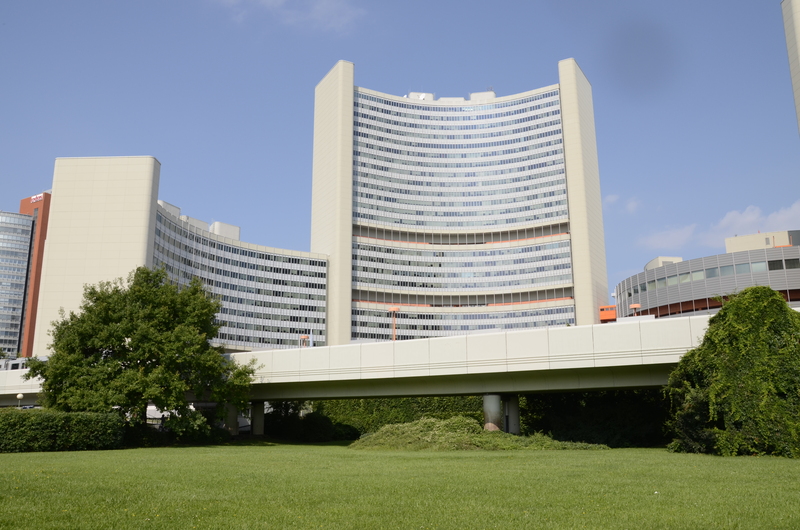 The Vienna International Centre (VIC), colloquially also known as UNO City in Vienna, is the campus and building complex hosting international organizations in Vienna, Austria. The VIC , designed by Austrian architect Johann Staber, was built between 1973 and 1979 just north of the river Danube. The initial idea of setting up international organization in Vienna came from prime minster Dr. Bruno Kreisky himself. Six Y-shaped office towers surround a cylindrical conference building for a total floor area of 230,000 square metres. The highest tower stands 120 metres tall, enclosing 28 floors. About 5,000 people work at the VIC, which also offers catering and shopping facilities and a post office. Two banks (Bank Austria and United Nations Federal Credit Union offices), travel agents and other commercial services have offices on the premises as well. The VIC is an extraterritorial area, exempt from the jurisdiction of local law. Vienna is the only European Union city to host one of four UN headquarters, along with New York, Geneva and Nairobi. The VIC has long assumed landmark qualities. It also reflects the way Vienna perceives itself as a platform for international meetings in the heart of a united Europe, as much of the world’s history has been shaped here. Numerous international organisations and non-governmental organisations (NGOs) are also located in Vienna, among them the Organization of the Petroleum Exporting Countries (OPEC), and the Organization for Security and Co-operation in Europe (OSCE).